(EN) At seven years old, he was intrigued by chickens. At 18, he decided to collect art. At 22, he opened his first movie theater. Whatever Juerg Judin does, he does with passion – and without compromise. (EN) For decades, he was successful in the movie business. Today, he’s one of the most influential gallerists in Berlin. Now, three chickens of the noble Indonesian breed Ayam Cemani live in his garden, along with some equally exotic geese and ducks – signs that Juerg has arrived. At least for the moment. His arrival also has something to do with his unconventional home: a converted ‘50s gas station in the middle of Schöneberg. 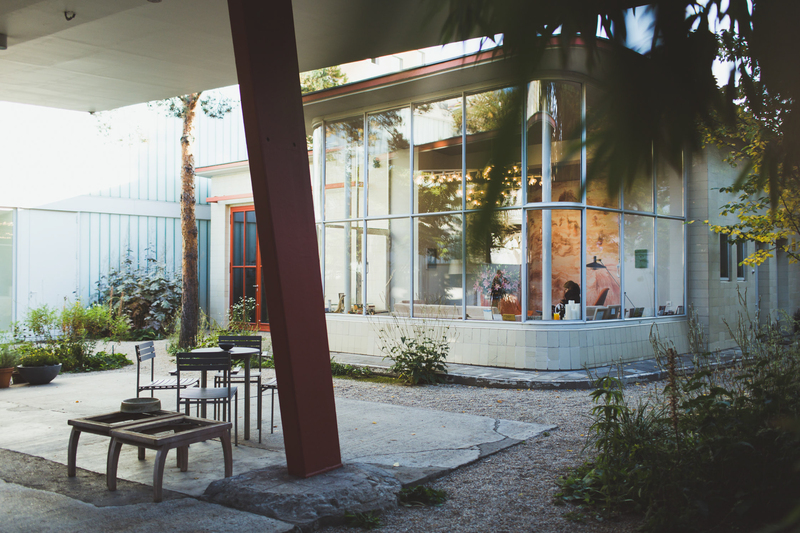 (EN) Juerg’s living quarters are connected to a library and private exhibition space, but the heart of his home is a large, open kitchen. The 52-year-old enjoys cooking so much he ends up spending most of his time there. He’s so dedicated to it that he even makes his own vanilla sugar, infusing it with fresh beans until the right aroma is achieved. (EN) When he doesn’t have visitors, Juerg sometimes enjoys meals right in the kitchen, dispensing entirely with the dining room, itself located in the new part of the house. Next to the kitchen is the living room, which, until 1982, was still the sales area of the gas station. Where gas, oil, magazines, and chocolate were once sold, today hangs a Bauhaus-style chandelier from the historic Gesellschaftshaus Palmengarten in Frankfurt – a one-off production. Beneath it stand some chairs from the ’50s, where Judin sits as we begin our chat. This portrait is part of Home Stories – a collaboration Freunde von Freunden produces with Siemens Home Appliances. To find out more about Juerg’s work, see the portrait with him on the Home Stories site. (EN) How important is it to you to have outdoor space in your home? (EN) Very. It’s a true luxury to have a house with a garden in the middle of the city. That surely played a part in pushing for the conversion of the gas station into a home. You might not know this, but aside from an avid cook, I’m also an avid ornithologist. Here in this special property I can combine both: I have the rare opportunity to keep an interesting group of wonderful birds and to plant my own tomatoes and herbs. (EN) Do you enjoy that mostly for yourself, or are you also making a statement with this urban oasis? (EN) Building a garden with 50-year-old pines in the middle of the city is of course a kind of statement; especially since the wall keeps this haven hidden from the outside world. You can’t experience the oasis-like quality of the garden until the door closes behind you. I don’t think something like that can really be planned – it developed organically. What was deliberate was the preservationist approach of the house. Most old gas stations have been torn down in recent decades. Thus, the conservation of this building was a major concern for me from the outset. (EN) How long have you had the gas station? (EN) I bought it in 2005, but the first time I saw it was in 1992. It had already been on the market for seven years, unused. A ‘For Sale’ sign with a phone number hung in the window. I photographed the place almost every time I was in Berlin, documenting its slow decay. Here was this somewhat sad useless construction in a perfect central location – it fascinated me and somehow called to me: do something with me! (EN) You had been taking photos of the building for quite a while. Why did you wait so long to buy it? (EN) At the time, I was commuting between London and Zurich. In 1992, I spent a wonderful summer in Berlin for a film production and fell in love with the city. After that, I started coming here regularly and going past the station. One day, after 13 years, the fro-sale sign was suddenly gone. I thought, Oh God, someone bought my gas station. (EN) Then it turned out that the sign had simply fallen down; the gas station was still to be had. At that point, I knew, Okay, that was probably a wake-up call. (EN) So you bought, renovated and expanded the gas station. What constitutes the building’s special charm today? (EN) It clearly reflects a specific period, a formative decade for Berlin. In its pursuit of light and rounded forms, it represents the style of the Wirtschaftswunder years. I wanted to preserve that – the canopy, the sales space, the garage door, everything. It wasn’t until later that I realized there was also still space for a garden. 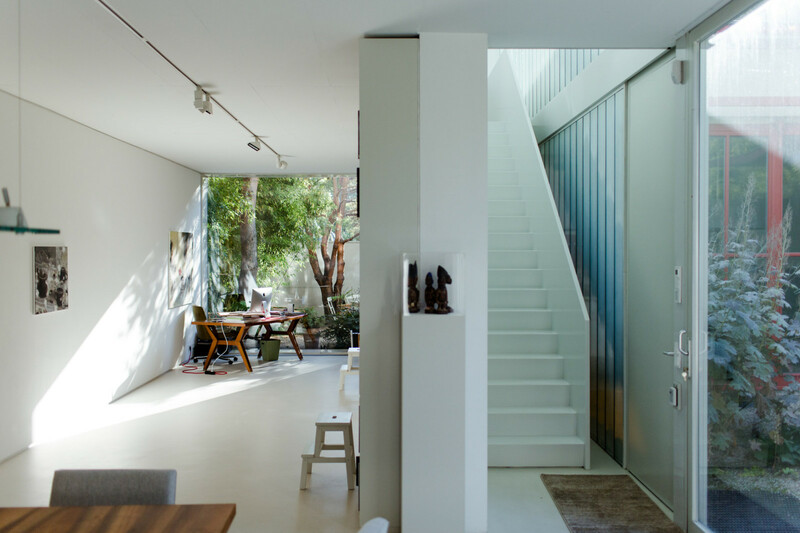 The property was not, in any case, intended as a living space, but as a studio for an artist-in-residence project – hence the large studio room with natural light. (EN) Until I realized that everything here is actually quite tailored to me. At the same time, the project was becoming more and more elaborate. At some point I realized, no, I’m moving in here myself to begin with – the artists will have to wait (laughs). (EN) Did you deliberately coordinate the furniture with the style of the building? (EN) Funnily enough, the furniture I’d owned for years happened to fit exactly right – I’d already been taken with the ’50s some time earlier. Still, I gave a lot of thought to how things should look in here. Of course! I live with art; it’s my profession and my passion. So when I was furnishing the place, I made sure it’d also be a good place for art. After that, I considered my other passions: cooking, for example. My kitchen is the heart and center of the house. (EN) Is the kitchen one of the building’s most modern elements? (EN) I think the kitchen’s rather timeless. Besides, the term ‘modern’ can experience many incarnations. The colors on the walls, for example, are from Le Corbusier’s 1931 polychrome series – a modernist masterpiece. The furniture is from the ’50s – also a modern era – while other stylistic elements are markers of our time. The 20th century comes together here in a new domestic unity, if I may say so. (EN) Speaking of domesticity: what does it take for such a highly conceived living space to also feel lived-in and cozy? (EN) Coziness is created by habits and their traces. To be completely honest, the only truly inhabited and animated room in this house is the kitchen. That’s where I am virtually around the clock when I’m here. (EN) Where are you otherwise? (EN) At my gallery on Potsdamer Straße. I’m one of the few gallerists who really works at the reception desk. I think it’s important to be there. It’s my job to bring people close to art. I do that here in my private sphere as well. (EN) A private sphere that you also make accessible to the public? Or is the gas station as a private area strictly separated from the gallery on Potsdamer Straße? 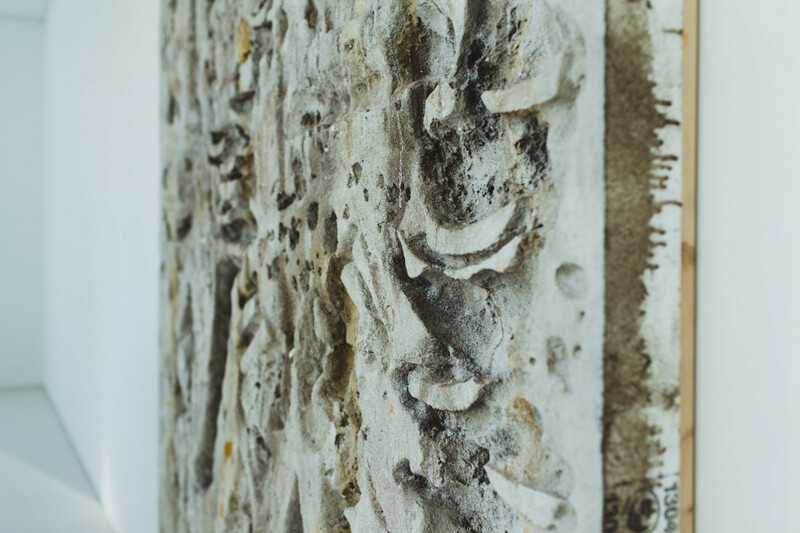 (EN) What qualities must an artwork have to find a place in your private collection? (EN) It has to fit into one of my areas of interest – there are quite a few! They include the 19th century, the Weimar Republic, contemporary art and twin figures from the African Yoruba people. 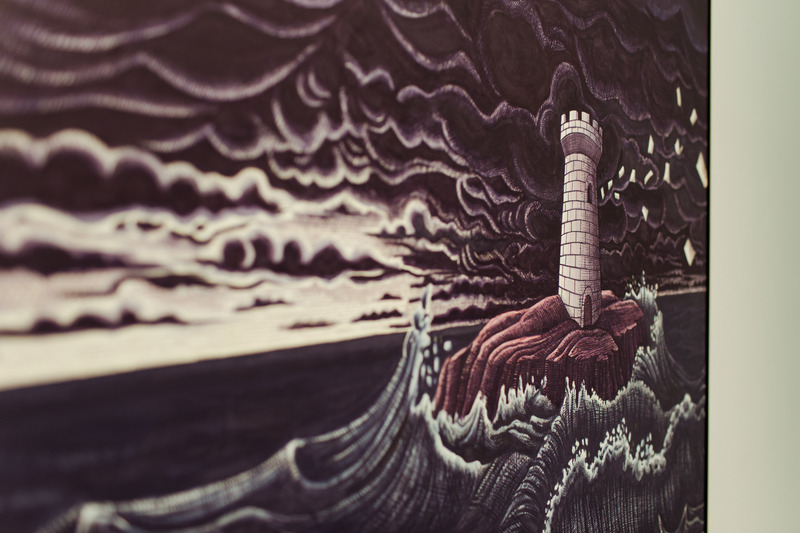 (EN) Does your art also have to provoke a certain feeling? (EN) No, my approach to art is actually more intellectual – in an art historical sense. Of course there are also artworks to which I have an emotional attachment. But first and foremost, a work of art must appeal to my mind, not my gut. (EN) Do you select the artists for your gallery according to similar criteria? What’s your approach to choosing? (EN) The selection of artists for a gallery program is a very special and complex thing. The way I understand my job is that when I include an artist in my program, it’s like adopting a child or getting married. You’re bound to one another for the next years. That’s why it’s such a difficult and important decision. Also because as an avowed family man, it’s hard for me to consciously separate the private from the professional. (EN) Do you somehow manage to do it anyway? (EN) Usually. Though most of my artists really are friends. And all of them like to eat! Nothing upsets me more than when one of them suddenly starts a diet. At that point, our relationship is deeply compromised (grins). (EN) How did you get into art? (EN) When I was 18, I consciously started to collect art. (EN) That’s early! What was your first piece of art? (EN) A drawing by Sigmar Polke from the ’60s – straight away something serious. I paid that piece off for a long time indeed – at least a year, I think. This patient installment paying has recurred a few times in my collector’s career (laughs). Sometimes you simply have to buy a piece that you can’t really afford (briefly lifts his index finger): only then are you a true collector. (EN) What people have inspired you the most in life? (EN) The catalyst with art back then was my friend Mariette Althaus, who was Polke’s muse in the late ’60s. Beyond that, I’ve of course been influenced by encounters with artists as well as by exhibitions you leave knowing you’ll never again see the world through the same eyes. (EN) Your mother was an architect. Were you to some extent following in her footsteps in converting the gas station? (EN) I was always interested in architecture – even as a career aspiration, for a while. My father, however, said I didn’t have the discipline to make it through the necessary course of studies. Pedagogically speaking, that was perhaps a bit of a blow below the belt, but he was probably right. Still, even before the gas station, I dabbled in buildings and the development of construction projects. At this point, Juerg’s phone vibrates. He picks it up and knits his eyebrows. “This is my new phone,” he explains. “Sorry. I can’t take it with me to the concert hall because I’m always afraid it’ll start up even though I’ve turned it off. The ultimate nightmare – in the middle of a pianissimo, the whole philharmonic quiet, just one violin playing, and it’s my phone that rings!” To be safe, he switches it to airplane mode. The interview continues. (EN) You achieved quite a lot at an early age. What gave you the confidence? (EN) Frankly, I’m sometimes amazed at it myself. I had real chutzpah in my early 20s. It was a mixture of confidence and bravado that in retrospect was also a bit dangerous. Today, I sometimes wonder how I even came up with any of it. My parents were rather cautious people. I can’t imagine that my mother would have done this project as an architect. (EN) Are you still a daredevil? (EN) According to my employees, yes. I myself feel that without calculated risk, nothing can happen. I’ve been a businessperson my entire life – whether it was movies, art or construction. Without risk, there’s no business. Lately, however, I’ve become a bit more tempered with age. (EN) Do you usually follow your gut or your head? (EN) It was with that approach that you created your gas station and thereby a highlight of the German architecture scene. When did that become clear to you? (EN) From the very beginning, there was a lot of public interest. And I somehow considered it my duty to open my doors to anyone interested. I did that happily. These days, I keep it more private since I’m also a rather reclusive person. (EN) Are you also a little proud of what you’ve created? (EN) Yes. I’m a little proud – and I’m proud of the architects, Thomas Brakel and bfs design, and of my wonderful landscape architect, Guido Hager. Of course, this conversion was my idea. But the result was thanks to great team effort. For me personally, in any case, it’s now mainly just my house. I have to water the plants, feed the animals – after seven years, it’s become my home. (EN) Could you imagine having a home like this in the country? (EN) I think about it every now and then, of course. But I also know that I’m a profoundly urban person. That’s why this is such a happy solution for me. What I’m doing here was actually validated in a sense by an especially lovely story. The great gallerist and curator René Block came over to visit one day. We sat here where we’re sitting now, and he told me that he opened a gallery on the neighboring property in 1965 where he showed Richter, Polke, Beuys and all the now famous postwar artists – many of them for the first time. And where did these artists buy their cigarettes? Right here! For me, that was like a retrospective blessing for having converted this place from a gas station into an art site. That was a very lovely encounter. (EN) Many thanks for inviting us, Juerg, and many thanks for the chat. 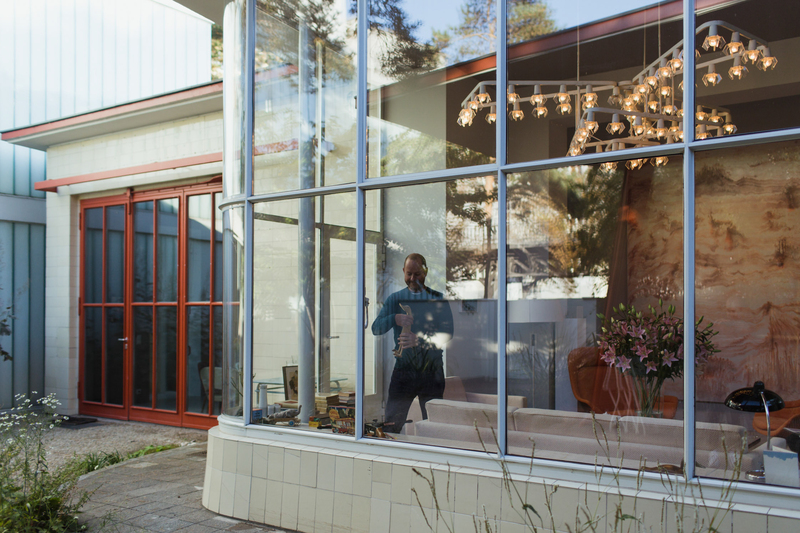 To find out more about Juerg’s converted gas station and the story behind it, see his portrait on the Home Stories site. 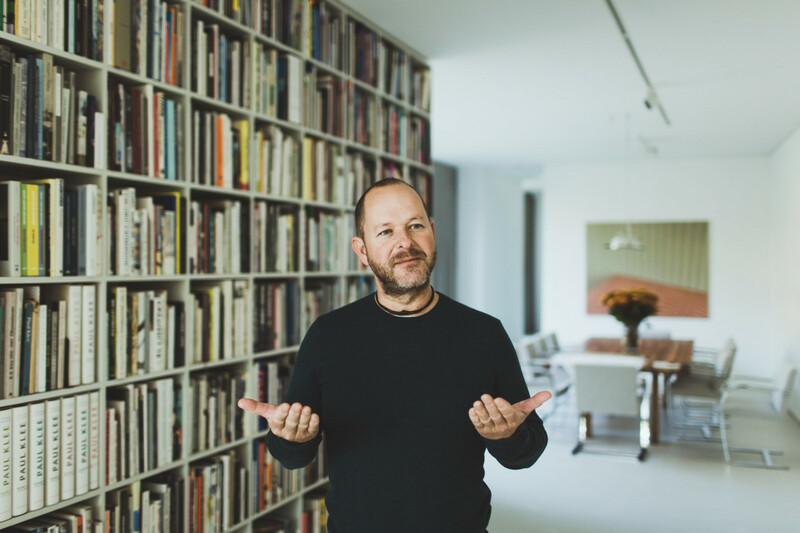 There, the influential gallerist discusses his approach to combining historical and modern elements, how he renovated such a singular building and his goal to bring people closer to art. 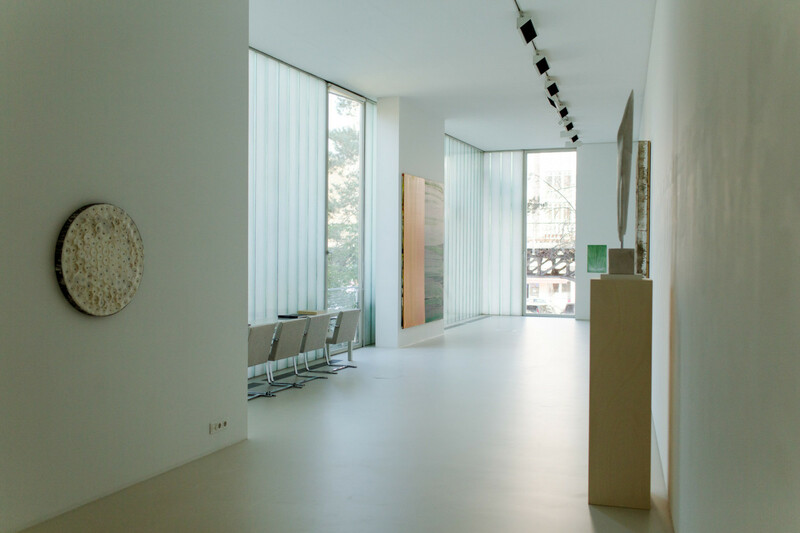 You can also visit Juerg’s Galerie Judin to find out more about upcoming exhibitions. 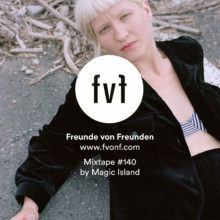 Freunde von Freunden. See the whole series here.